Vtiger is an all in one CRM designed for small businesses. It was founded in the year 2004 and it integrates the features that go beyond the standard capacity suite of the typical CRMs. Vtiger system has been tailored to meet with needs of the clients based on the feedback provided by the customer base. Vtiger allows the users to thrive on a more productive business, and helps them to stay informed about it and to avoid data duplication. Vtiger is able to deliver great sales automation capabilities, email marketing functionalities and project and inventory management. Vtiger represents a set of unique tools that are used for the improvement of interaction with the potential customers. The web-to-CRM forms provided by Vtiger help in capturing the relevant contact information, prioritizing and using that information for making smarter business decision. Finally, Vtiger is an affordable CRM system, tailored to suit small businesses’ tight budgets. It offers a sales and a support set, both available in a starter and professional version, depending on the number of users you want to include. A 15-days free trial is also available. 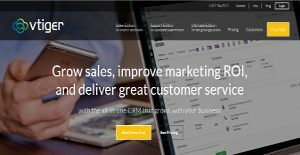 Vtiger CRM provides the sales, marketing, and the support teams with a variety of opportunities regarding their customer relationships, and enable them to build strong and long-lasting business connections. The purpose ultimate of Vtiger CRM is to gather collaboration and organization tools in one place, all of them designed for the sake of the ideal customer experience. Vtiger CRM helps the organizations to improve both prospective and current customer experiences by automating their sales, support, and marketing tasks and developing a variety of business-enhancing insights. Vtiger helps users to maintain the ircontacts, automate the repetitive tasks, track the campaigns, and compile an extensive report about the sales, marketing, and the support tasks being performed in the organization. The custom reports use multiple filters to focus on the specific lead characteristics, and this is achieved by automating the entire workflow. Users reduce the repetitive tasks, and save the time as a result. Vtiger tracks the marketing campaigns over time, and helps in pinpointing what is working for the business and what is not. The most agile solution Vtiger provides is the strong client base management functionality. The portal support of Vtiger allows the customers to search trhough the past issues and their resolutions, and to customize the database to make it suitable for future operations. At the back end of the portal, the support agents can create, document, and track the issues with the help of automated follow-ups. Moreover, the customers are provided with the ability to monitor the status of their issues from the opening to the closure moment. There are popular and widely used applications in each software group. But are they necessarily the best fit for your organization’s specific needs? A trendy software product may have thousands of customers, but does it provide what you require? For this reason, do not blindly shell out for popular systems. Read at least a few Vtiger reviews and consider the factors that you desire in the software such as the price, main features, available integrations etc. Then, shortlist a few systems that fit your requirements. Try out the free trials of these apps, read online comments, get clarifications from the vendor, and do your homework thoroughly. This profound research is sure to assist you choose the finest software platform for your company’s unique wants. How Much Does Vtiger Cost? We realize that when you make a decision to buy CRM Software it’s important not only to see how experts evaluate it in their reviews, but also to find out if the real people and companies that buy it are actually satisfied with the product. That’s why we’ve created our behavior-based Customer Satisfaction Algorithm™ that gathers customer reviews, comments and Vtiger reviews across a wide range of social media sites. The data is then presented in an easy to digest form showing how many people had positive and negative experience with Vtiger. With that information at hand you should be equipped to make an informed buying decision that you won’t regret. Using it for our company. Functions efficiently and with excellent support. Flexible and worth every penny. It's a robust CRM software that can be customized and with sales/service integration. One of the top open source options available. What are Vtiger pricing details? What integrations are available for Vtiger? Pros: It's fully functional. Highly flexible. Vitger CRM is a robust software that almost all modules you'll ever need. It works well regardless of the industry you're in. Cons: VtigerCRM happens to be one of the greatest CRMs I've ever come across. However, it does have some downsides. It would've been great if Vtiget has some kind of a backup functionality that allows customers to make configurations. While Vtiger has a login history check, it'd be nice if possesses a static IP address mapping to prevent unauthorized remote access. Pros: I love the flexibility of this software. My systems admin working for my employer had a relatively poor setup. But after using the software for a few years, we're able to finally automate and carry out processes. This include extracting data for our own custom design report writer. Its potential is something that my employer really realized completely. Cons: Setting things up initially is a long process. This would make it more difficult if you haven't worked with this kind of software. But then again, who wouldn't face the same scenario, right? It's now running to a crawl since my company expanded and/or a lot of history were housed in there. It's fully functional. Highly flexible. Vitger CRM is a robust software that almost all modules you'll ever need. It works well regardless of the industry you're in. Caters to all my features, can be customized, and bundled with helpful support. Endless possibilities in tailoring a solution that works for you!